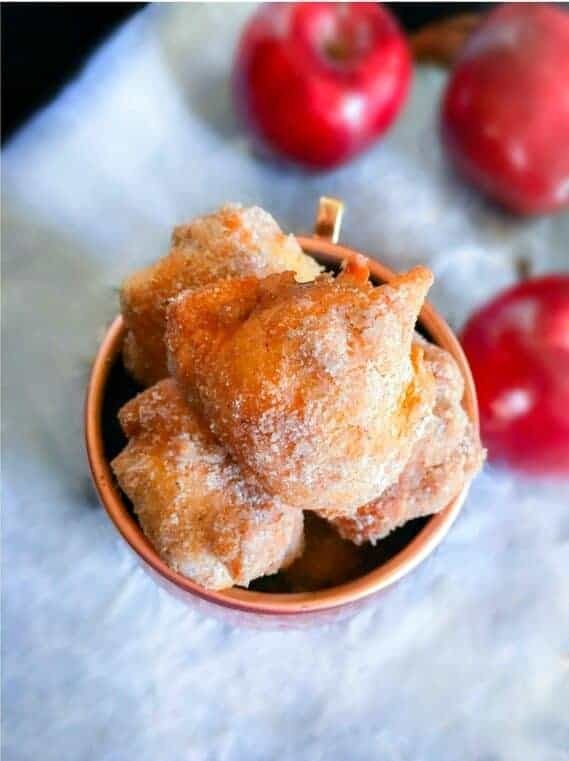 Best Apple Fritters Recipe with Chai Spice Sugar : They are the best, fluffiest and softest apple fritters dusted with homemade chai spice sugar. Made using granny smith apple, they are a comforting delight in every bite. 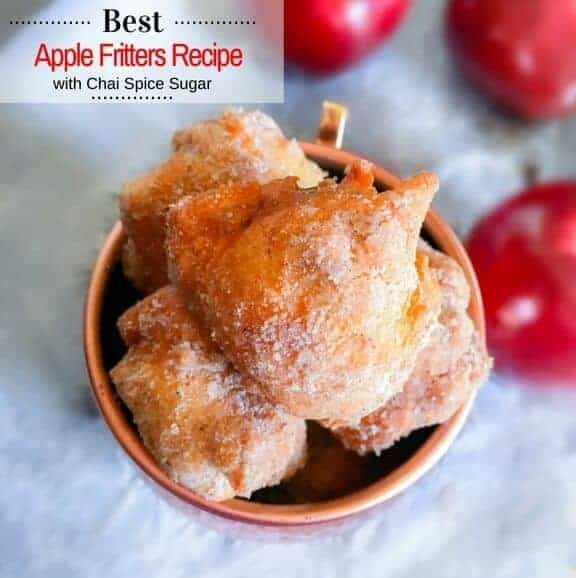 If you haven’t tried apple fritters then you are definitely missing something absolutely delicious and these Best Apple Fritters Recipe with Chai Spice Sugar are totally a treat. Okay, yet another confession time – I’m not a huge apple fan and always come up with the weirdest of excuses for not eating them…like too much fiber is bad (Seriously – hehehhe). BUT, give me desserts made out of apples and I’m the first one to bite into them, especially apple tart – oh #nomnom! After a recent visit to Costco and yet again getting things more than we could consume (Don’t tell me I’m the first one to do that), and more than our pantry and fridge could adjust. We were left with tons of fresh fruits – including 2 different kinds of apples (24 in total – now we are talking). 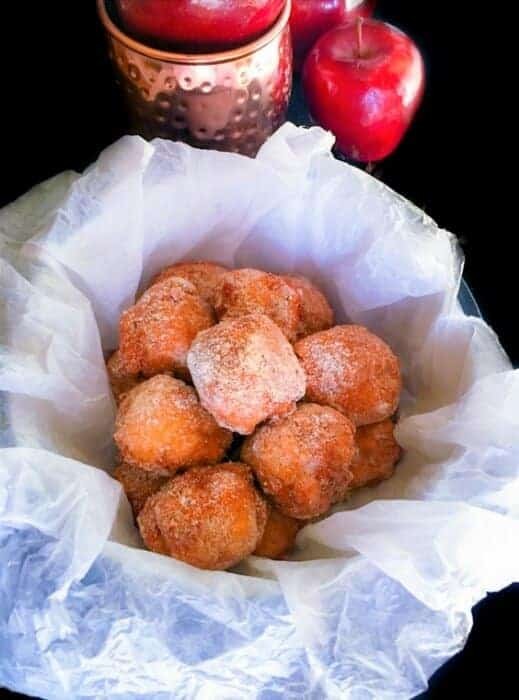 So what better way to consume them than making these delectable apple fritters. Who know’s my unconscious mind was already thinking about it and hence so many apples 🙂 and if it’s the ‘season of fall‘, who could resist ‘chai spice‘ and ‘pumpkin spice‘. Nothing excites me more about the fall/winter than these two spice blends, especially ‘Chai Spice‘. 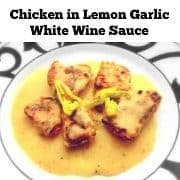 It gives me that almost home kind of a warm fuzzy feeling which is a complete home run for me and what’s better than including these 2 fall favorite in one recipe. Also, the fritters dough includes a combination of ingredients that results in an extremely soft and fluffy fritter every time hence Best Apple Fritters Recipe with Chai Spice Sugar . Why do we need 2 Kinds of Sugar? 2. If we just use just the brown sugar with spice mix, it lacks that clingy powdered sugar look and feel. Hence for the Best Results, use a mixture of the two (however you can increase or decrease either one of them as per choice). Once, our chai spice sugar mix is ready lets dice that apple into tiny bits (but if you like biting into chunks of apples, then you can chop them in medium bite size). Add all the dry and wet ingredients together, throw in the apples and mix. 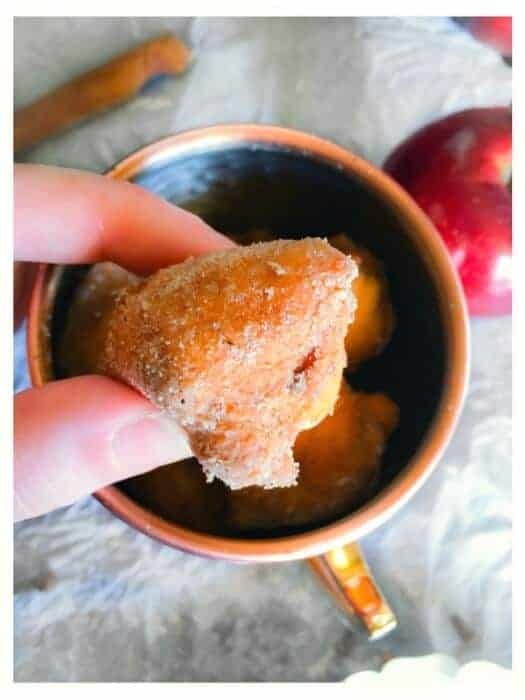 Using an ice-cream scooper or two spoons method (one for scooping the dough and other for sliding it into the hot oil), fry these apple fritters to a perfect slightly darker golden color. Once cooked, dust them with chai spice sugar and enjoy!! If you would like to further enhance the taste a little, spray some whipped cream, sprinkle some chocolate sauce over them and enjoy with piping hot coffee or tea. 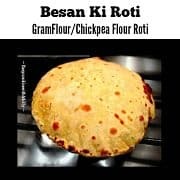 I can guarantee that if you follow the exact recipe, then everytime you make these, every bite will just send you into a warm fuzzy delicious state of mind that you’d never wanna leave. 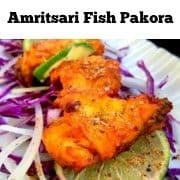 Especially with the coming labor day weekend, these would make a great finger food or dessert bite to share with your friends and family. So try these ASAP and Enjoy ! They are the best, fluffiest and softest apple fritters dusted with homemade chai spice sugar. In a large bowl, add all the Chai Spice Sugar ingredients and mix evenly, keep aside. Chop the apples into tiny bite size pieces and keep aside. In a large bowl, mix together flour, salt, baking powder and baking sugar. In a medium bowl, beat an egg and add milk, yogurt, sugar and evenly mix everything together. Now add the wet ingredients to the dry ingredients and fold everything gently to form a wet dough like mix. Add the chopped apples and lightly fold everything together. Heat oil in a wok or deep pan. Using an ice-cream scooper or 2 spoon method, scoop and drop the apple mix into hot oil (3-4 in one time to evenly cook). 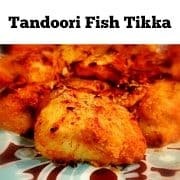 Let the fritters cook evenly on both side and as soon as they are slightly darker golden brown, remove them to a dish lined with paper towel (to absorb excess oil). Continue the process till all apple fritters are done. Now toss the apple fritters into the chai spice sugar mix (nicely coat on all sides). 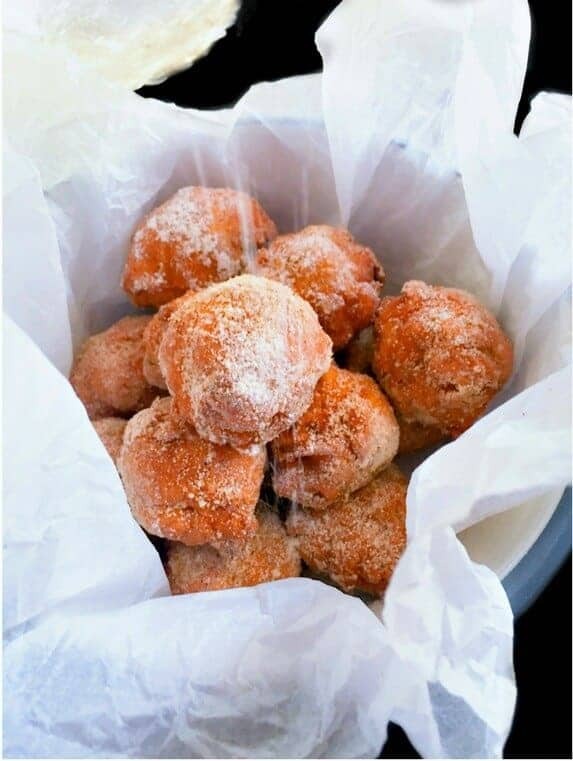 16 Replies to "Best Apple Fritters Recipe with Chai Spice Sugar"
These fritters look so scrumptious!! OH MY YUM! I can’t wait to try them–totally saving the recipe! These look so amazing! I love all things apple! Thise sound amazing! I’m a big chai fan so I am sure these would be lovely! Apples and Chai – such a great combo…and a great way to eat apples haha! These look and sounds absolutely delicious, Molly! Thanks for sharing! Oh man, these sound great! I am a huge apple fritter fan, and I can imagine just how great they are with the addition of chai spices!! They are really good Elizabeth, you gotta try them soon !! Thanks for visiting. I am loving the chai spice sugar that you added to these! My husband is a HUGE fan of fritters so I cannot wait to make these for the whole family. I know they’ll love them! This will be the perfect recipe for breaking in my new extra-large cast iron skillet! 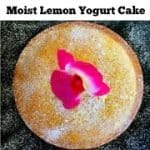 I’ve never tried making fritters, but I’m fairly certain my fiance will love it if I make these! I loved the addition of chai spice sugar!! I love apple fritters and your recipe is so easy to follow!! Thanks Ludmilla. I hope you get to try them soon!! !